Carrots are normally a cold weather vegetable- if you planted them early, just before the spring (beginning of April), they should be coming up now and you could plant a second round. They take maybe 50 days to mature, but if you plant them early enough you can plant more. How did the tire gardens work out? Also, why are some of the raised beds so tall? Does that help the plants grow better? The tires worked well on the first two tiers as we piled them up but we lost the plants when we added a third tier. We wanted to go 5 tiers which would give 15 lbs. of potatoe s. We’re unsure as to why the plants did not make it- we’re looking to restart that process and figure it out. The reason our raised beds are so high was so that folks in wheelchairs and older folks who maybe can’t bend over could still work in a garden environment by working higher on the raised beds. All the paths in the garden are ADA accessible and meet those requirements. We are in the process of improving the garden paths so wheelchairs can pass comfortably. We strongly believe in empowering those with disabilities to participate- everyone has the right to grow and eat fresh vegetables. How do you get small mites and other bugs off your plants? One way to do that is by using a spray bottle with a very, very small amount of dish soap, filled with water, and spray it on the plants. This will help repel the bugs without using very heavy chemicals. Food co-ops and health food stores often carry environmentally-friendly, biodegradable soaps. After you, say, clean your dishes, you can use the dishwater in your garden (this is called “greywater”). You could also use laundry water. How did you end up putting your garden in the International District? In general while working in the International District for SWOP we realized that the particular neighborhood we were at was lacking infrastructure and stores to provide healthy food and folks didnt have transportation- lack of public transportation is part of the problem- making it hard to go out and get good food. It’s a food desert. So we felt this neighborhood could benefit from a community garden. Talking with councilman Rey Garduño of that Distric he directed us to potential city property in the area that could be used for this purpose. Through his recommendations and help we were able to secure a corner of the nighborhood to work in. When is a good time to plant corn? The first full moon coming up in May is a good time to plant, to put down seed for corn. You want to put down, say, 3 corn seeds 1 inch apart, every foot. When they sprout to about 3 or 4 inches you choose the strongest one and pick out the other two. Everyone has a different way of doing it- this is just one way. For us, culturally, the planting time recognizes the San Ysidro feast day, which is May 15th, and the full moon planting time is a native tradition. You might consider planting the “three sisters” all at once, which are corn, beans and squash. The beans provide extra nitrogen to the soil, the squash provides natural ground cover to hold the moisture, and the corn stalks help the plants grow. Indigenous and Chicano folks have been planting the “three sisters” together for generations. What kind of manure should I use for my garden? You can use horse, chicken, goat, pig, cow manure- pretty much any domesticated animal. You can also use organic material composts made from plants and green manures. Animal manures need to age for at least 120 days before they are used or they can pass bacteria and pathogens into the food. Remember- too much manure can hurt your plants so use sparingly. Do a little research to find out what is right for your plants and your garden. This might be a good opportunity to call your NMSU Bernalillo County Extension Service, where master gardeners can give you in-depth answers. Where can I get good seeds to plant? You can contact us for small amounts of seed, or you can contact Urban Store (urbanstoreonline.com), or any local nursery. Be sure to ask that the seeds are non-GMO. If you have any seeds you would like to donate, we are creating a living seed library and we are accepting donations. 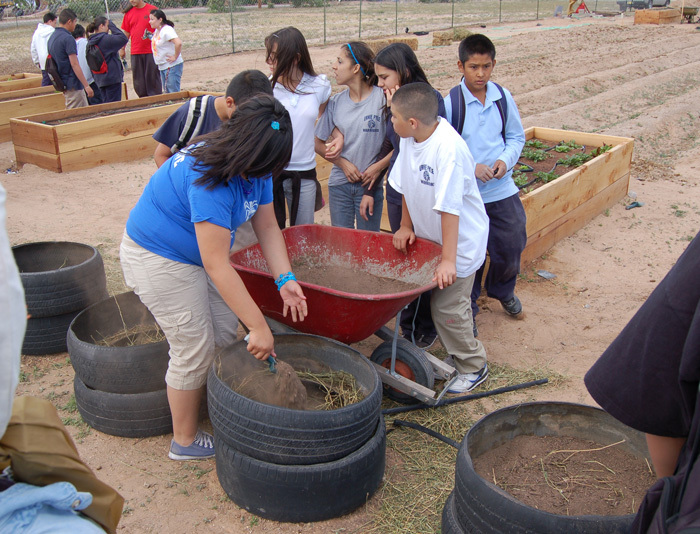 To contact Project Feed the Hood call Joaquín at (505)400-6545 or Rodrigo at (505)620-1476.